I have spent some time lately evaluating the creative journey that has led me to make jewelry. Early experimentation led me to wire wrapping and I haven't looked back. I am a researcher. Google led me to Preston Reuther...the Master Wire Sculptor himself. Preston's videos and DVDs provided hours of instruction..........and a great deal of encouragement. 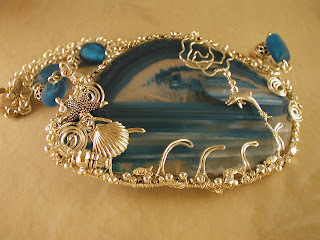 I love his flowing wire work with it's graceful loops and swirls that show a stone or cameo to it's best advantage. I am a reader. The Saratoga public library led me to Bead on a Wire by Sherilyn Miller. This book is probably the best reference for beginning wire artists. Sherilyn's technique is impeccable and I found myself unlearning quite a few self taught bad habits. I am a peruser of magazines. A jewelry magazine allowed me a glimpse of a piece made by Eni Oken. Eni's beautiful and intricate pieces are amazing. These 3 artists have given me so much inspiration. Their generosity in teaching their methods is a blessing to us all. Here are some of my efforts. You can see the teaching of my virtual mentors in the work.